Inspire your little one to become a budding cook with the colourful Bigjigs Toys Wooden Play Kitchen. 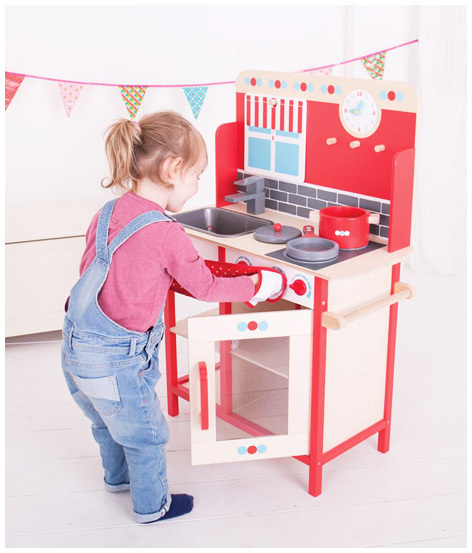 This lifelike role play toy kitchen has clicking dials, hanging hooks and is supplied complete with oven gloves, removable cooking utensils, saucepans and more! Your mini chef will be cooking up a storm in no time. The fun does not end there though; with a sink area they will be able to wash and clean up too. This is an ideal toy for learning about kitchen safety as well as healthy eating, especially when combined with Bigjigs Toys play food. Includes a clock with movable hands and a blackboard on the reverse side of the window scene. Please tell us what you think of the Bigjigs Toys Wooden Play Kitchen by Bigjigs.